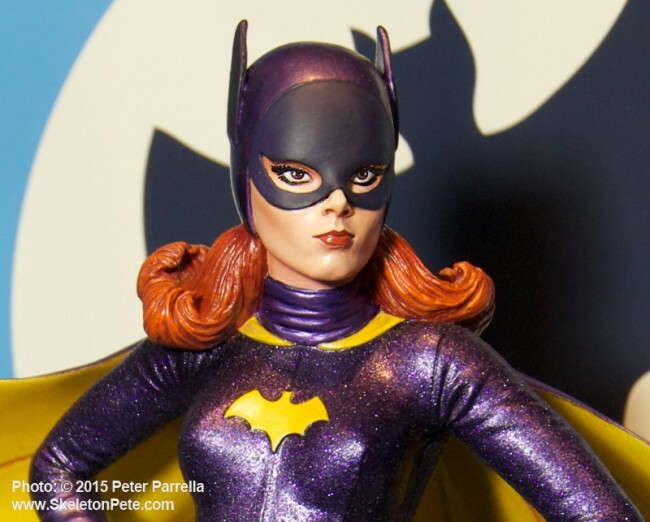 Sculptor Clayburn Moore captures Yvonne Craig’s Batgirl for Diamond Select Toys’ new statue. 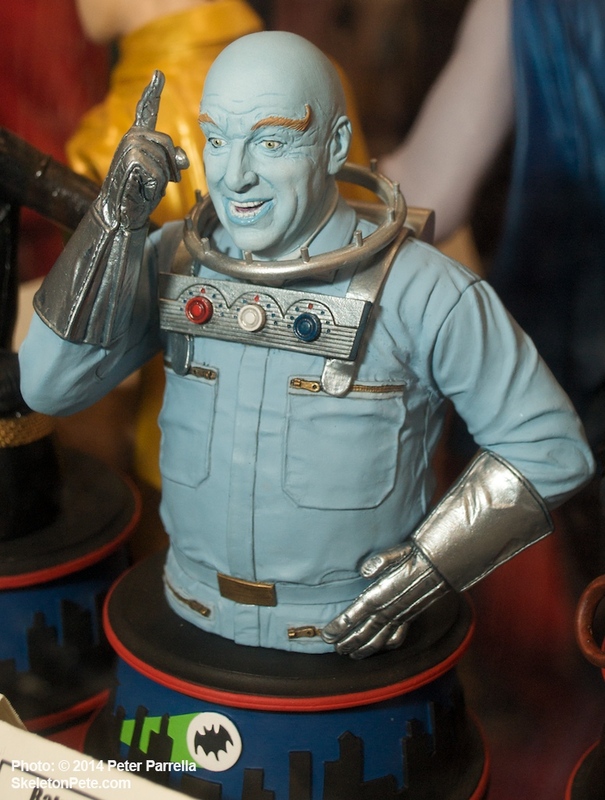 As with most “can’t haves” in life, the protracted nature of bringing ABC’s 1960’s Batman television series to the home video market produced a “must own” reaction in collector’s circles. 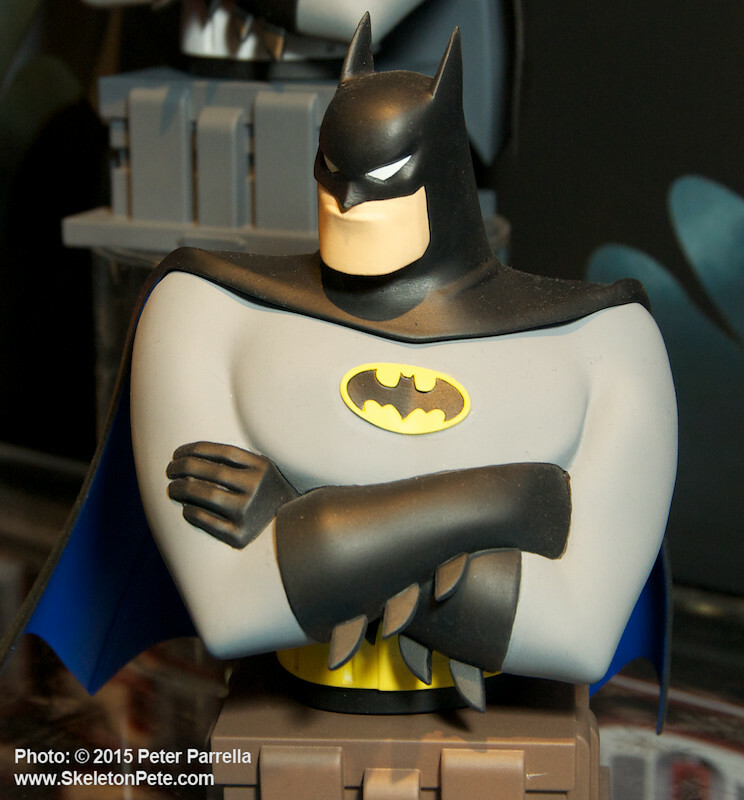 Warner Brothers’ massive 120 episode Batman Box Set, released in November 2014, satiated some of that desire, but the high crave factor for bat-a-phenalia has spread well beyond the DVD’s to toys and collectibles. 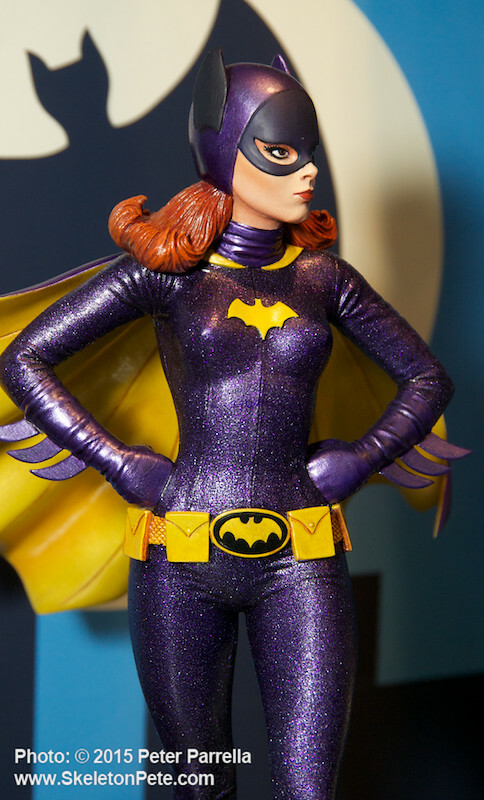 Each new product reveal becomes an event of its own and I think none have been more anticipated by “boomers” than Batgirl merchandise. Of course TV Bat-fans know that Season 3 cast actress Yvonne Craig into the fray as Batgirl, making the dynamic duo a triumphant trio. 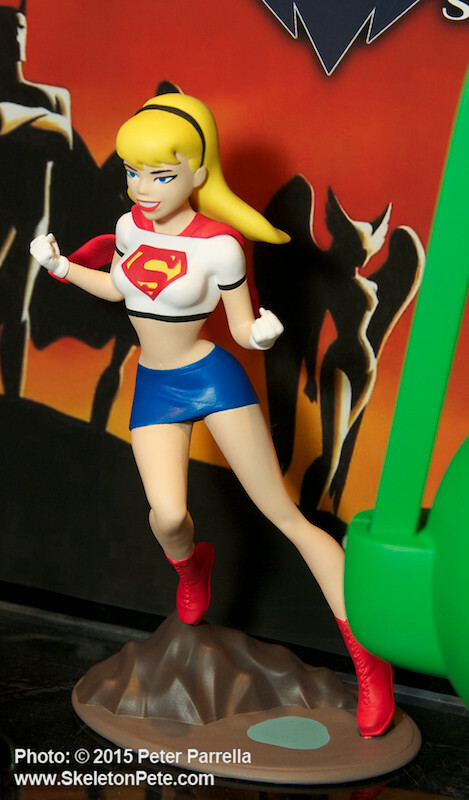 Though not the only DC comics Batgirl, Craig is certainly associated with the best known incarnation. In fact the character was created at the behest of the TV program’s producers who desired to expand the appeal of their boy-centric show to an untapped audience of young ladies. 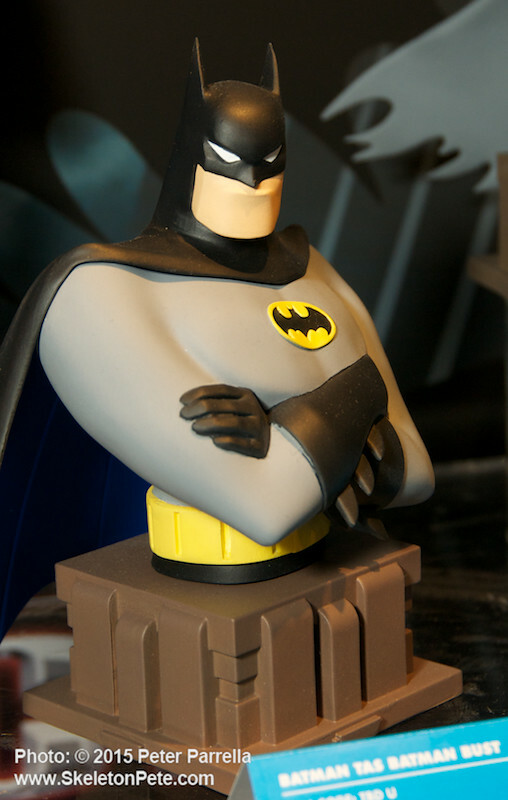 DC Comics’ Detective #359 re-introduced Batgirl to TV Batman fans. 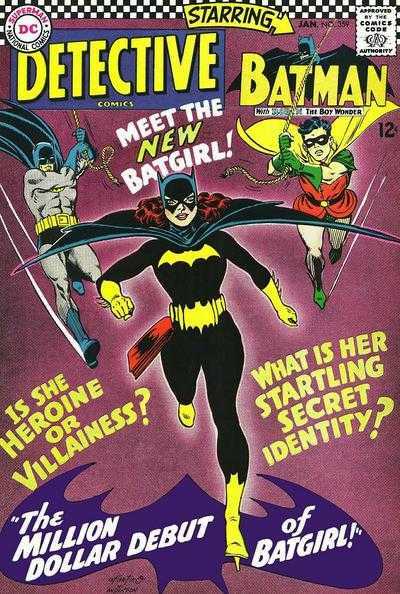 The “new” Batgirl appeared in Detective Comics # 359 in January of 1967, less than a year before her television debut. The cover is splashed with the kind of hyperbole that you could imagine spoken by the TV show’s producer/narrator William Dozier. 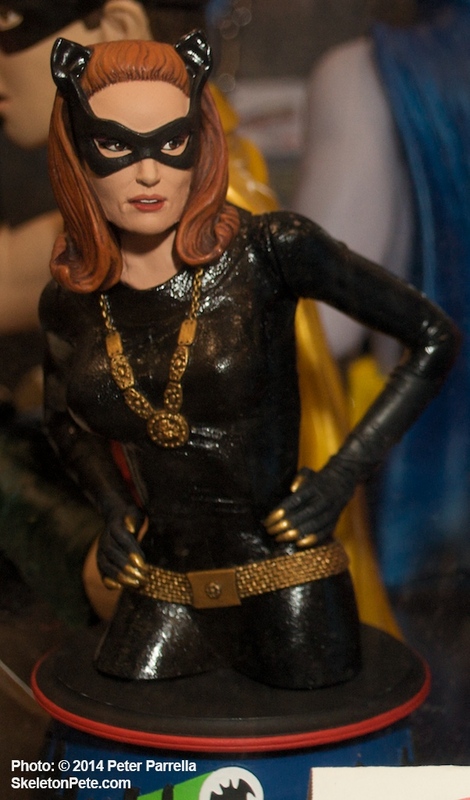 “Is she heroine or villainess?,” “What is her startling secret identity?” Artist Carmine Infantino and writer Gardner Fox spun up the tale of Barbara Gordon, daughter of the stalwart Gotham City Police Commissioner. That’s the same James Gordon whose backstory is the focus of Fox’s current TV series Gotham. Barbara thwarts an attempt to kidnap millionaire Bruce Wayne and finds her calling in crime fighting. 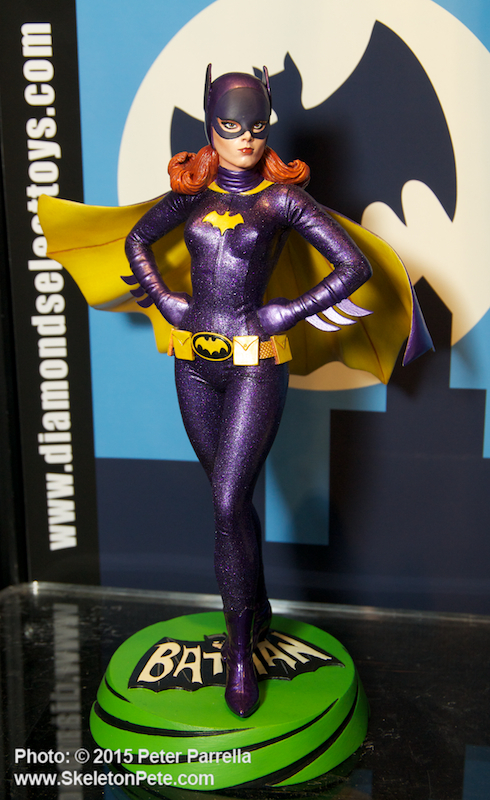 Diamond Select Toys’ Classic 1966 Batgirl Premiere Collection Statue. 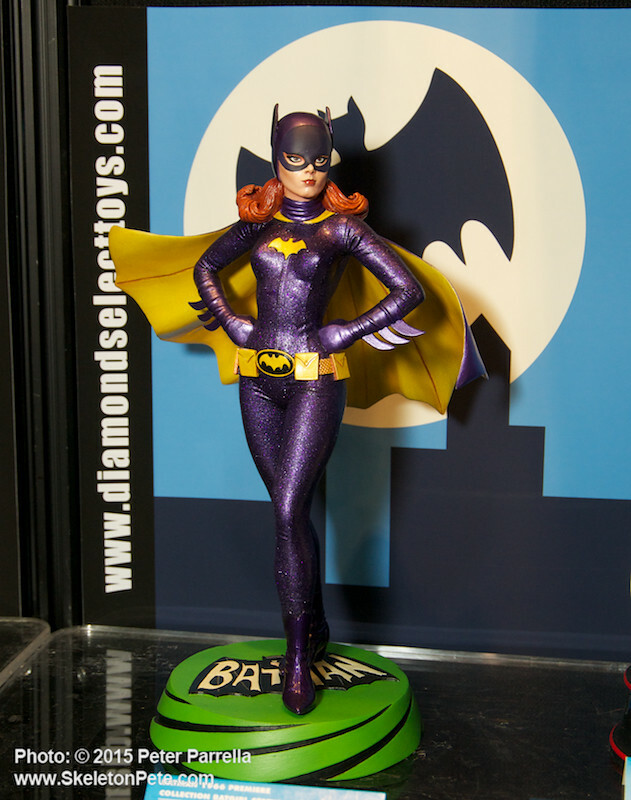 This summer Diamond Select Toys will bring you back to those Silver Age comic days with their Premiere Collection Classic TV Batgirl Statue. 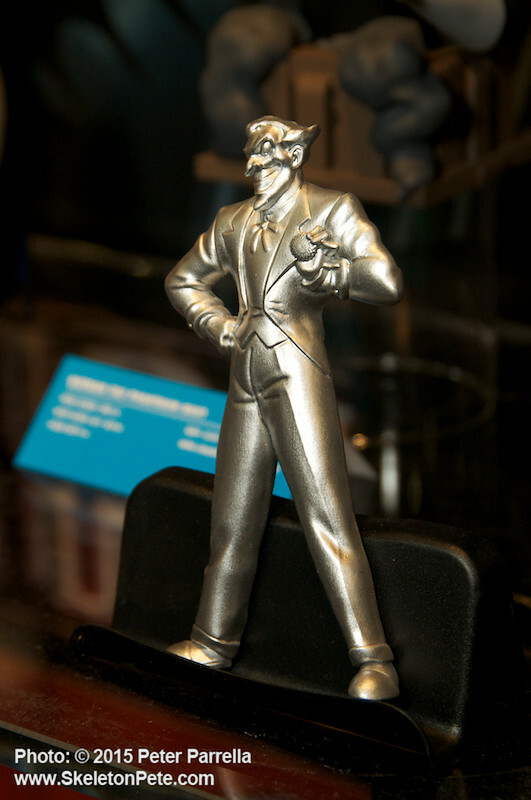 Having recently seen the prototype in person at the New York Toy Fair I can happily report that it wonderfully captures the karate kicking crusader seen on the screen. 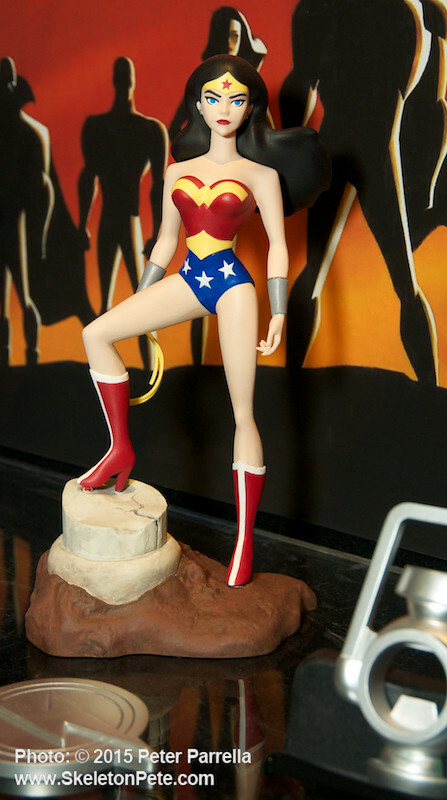 In the hands of master sculptor Clayburn Moore we get a spectacular representation of Craig in her role, fully approved by the lady herself. Moore’s choice to fan out the cape adds a kinetic element to the classic pose known from publicity photos of the time. His work on the facial features is delicate, instantly recognizable as Ms. Craig, and conveys the self assured nature of the character. 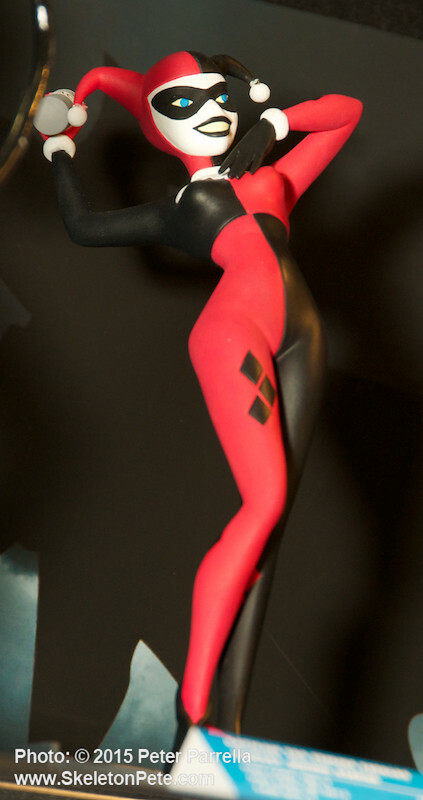 Measuring approximately 12 inches tall, the statue emulates the psychedelic and op-art design of the show. The eye-popping purple sparkle of the costume is perfectly emulated and offset against the yellow accent of the cape. The base’s green swirl is capped by the TV logo. 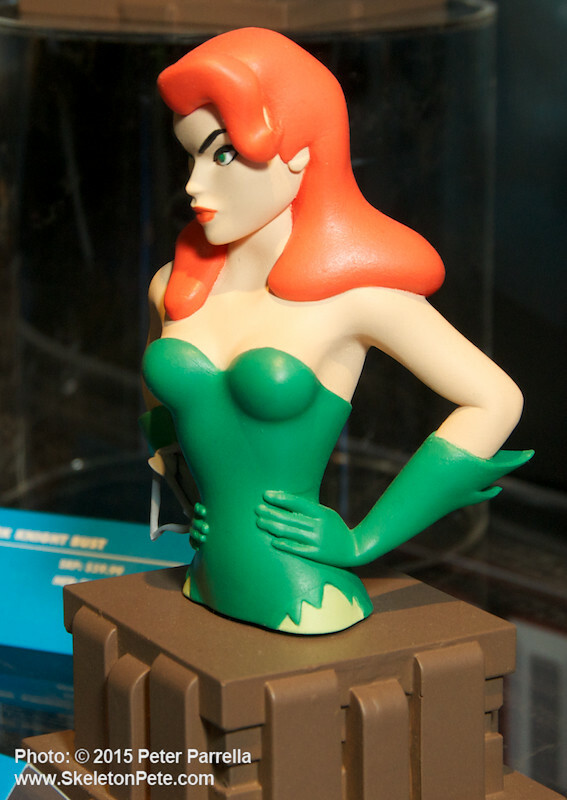 It is going to be a standout on any fan’s display shelf. In addition to playing Batgirl, Yvonne Craig’s career features a unique selection of memorable roles that include being a “Kissin’ Cousin” to Elvis, “Ski Party”-ing with Frankie Avalon, and as the slinky green siren Marta in the original Star Trek episode “Whom God’s Destroy.” Her autobiography can be purchased at her official website, and she has noted a limited return to the fan convention circuit this year based on the wealth of 1966 Batman licensed products. 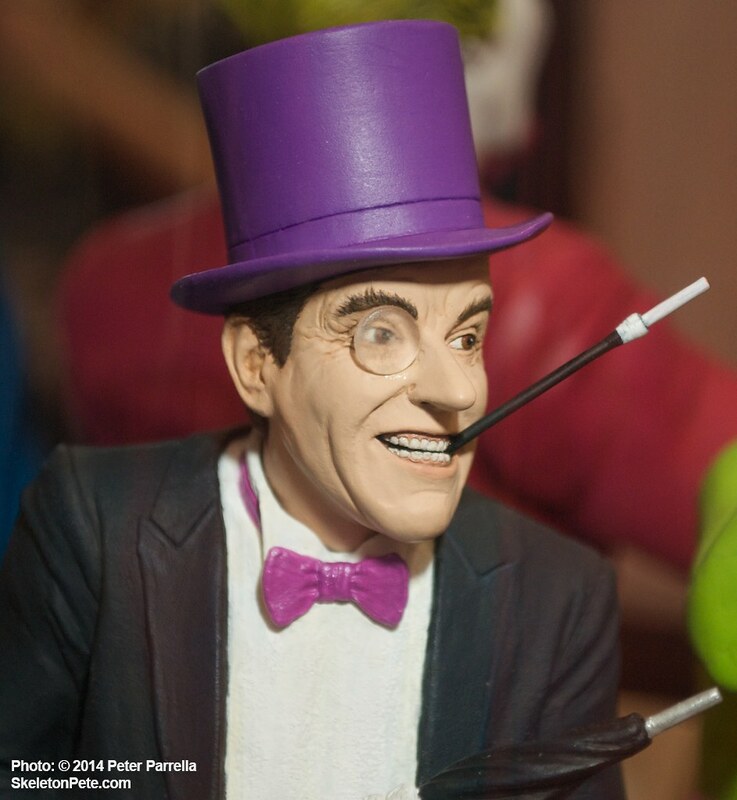 Clayburn Moore’s “Sculpting with Clay” blog, though not recently updated, is a excellent repository of information and images for those interested in the process of creating these collectibles. He takes you from wire frame to finished product views on many projects. 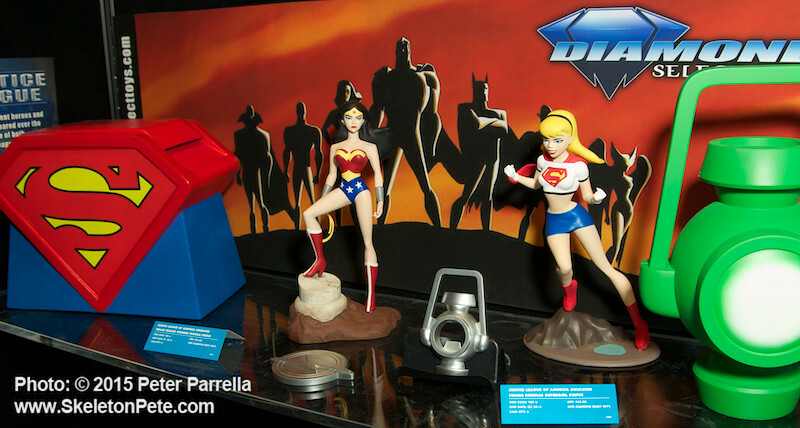 His studio home site, will give you a full view of his creations, including a range of DC Entertainment pieces. 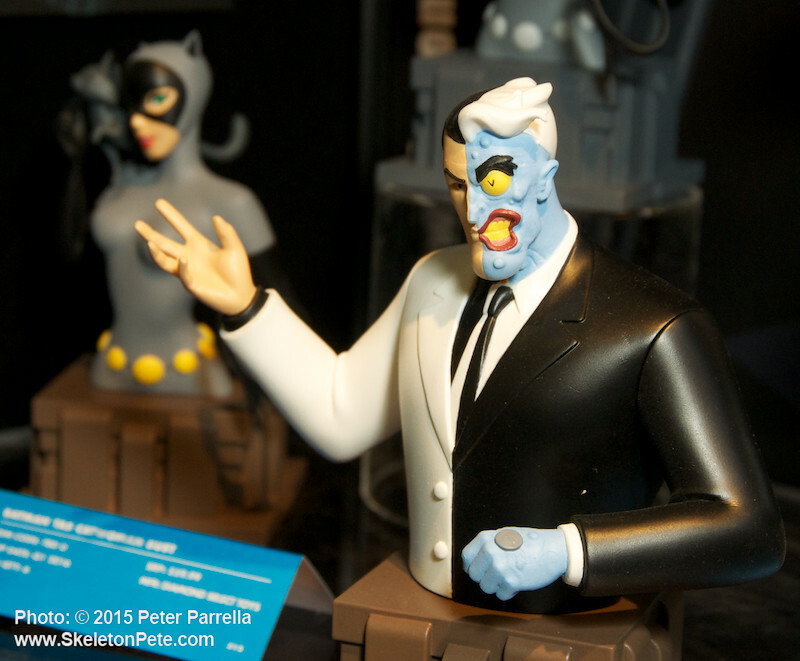 Diamond Select Toys expands Batman The Animated Series Bust Bank selection. 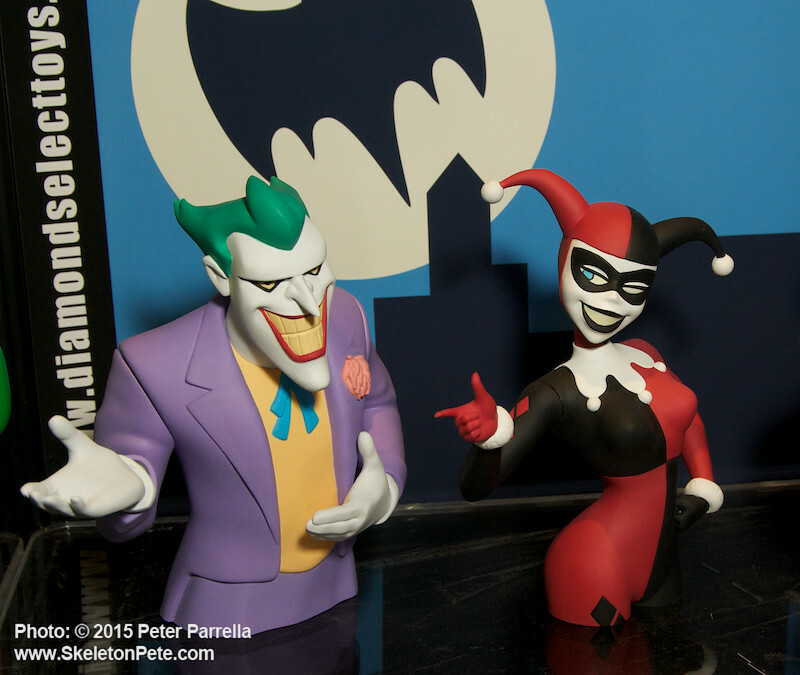 Hmm, maybe the Bat-Credit Card will be necessary as DST continues to fill out it’s selection of busts, banks and Femme Fatale statues with depictions of Batman, The Animated Series characters. 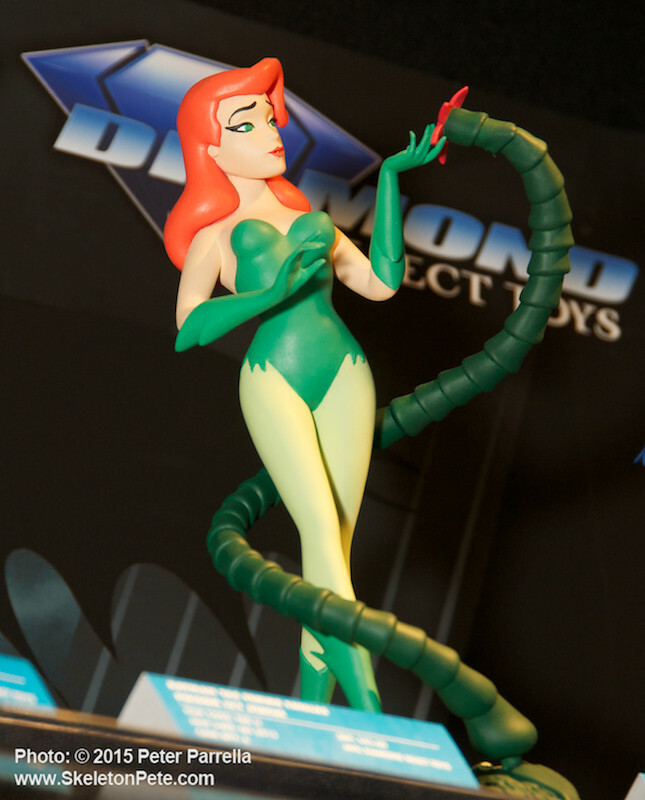 They’re all really sharp renderings of the 2D cartoon personas. 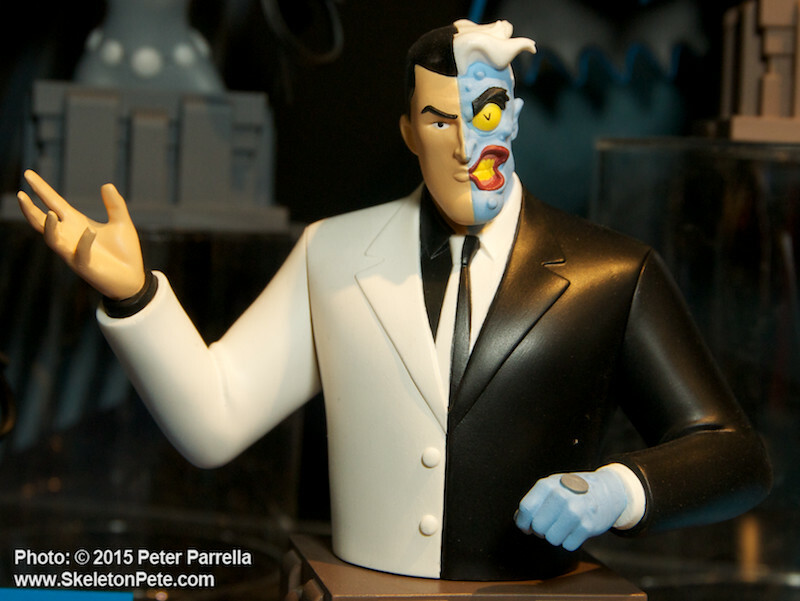 The Harvey “Two-Face” Dent bust is my favorite but you’ll have Batman in Classic and Dark Knight flavors, Catwoman, Batgirl, Phantasm, Harley Quinn, The Joker and Poison Ivy to choose from as well. Check the photo gallery below for a close-up look at those. 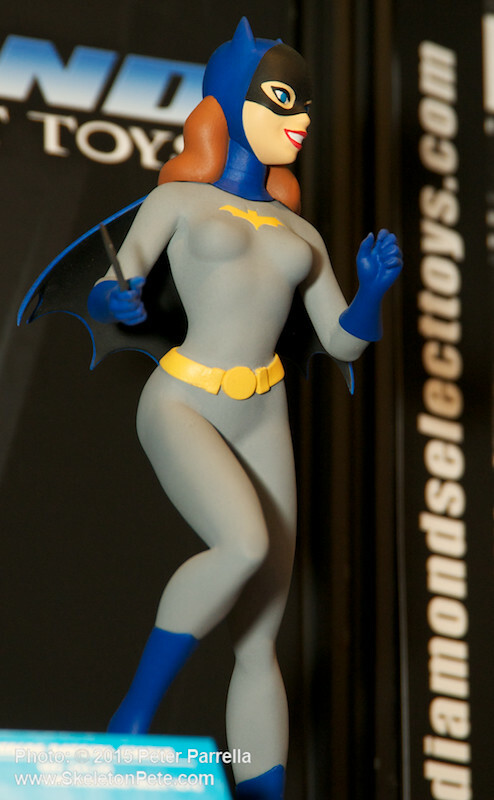 As much as I love DST’s 3/4 busts, I believe the company was very smart to commission a full length Premiere Batgirl statue as well. 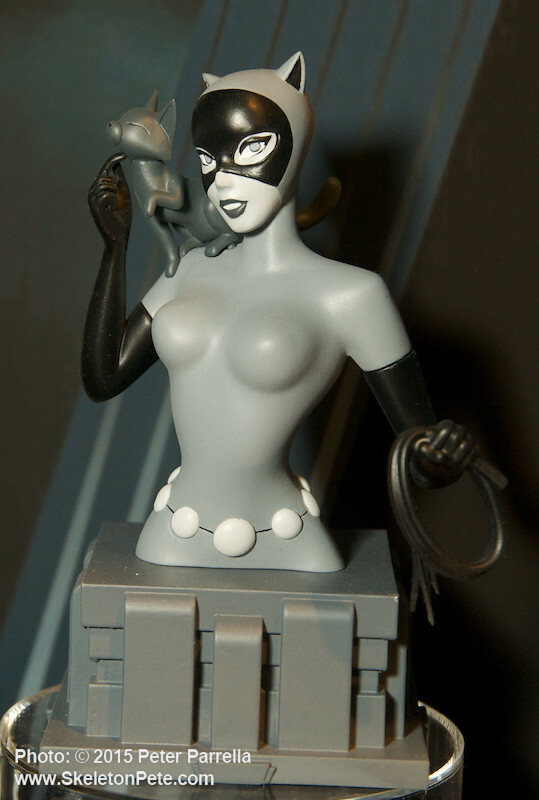 As the first piece of licensed Batgirl merchandise I’ve seen it sets the bar very high for those who follow. 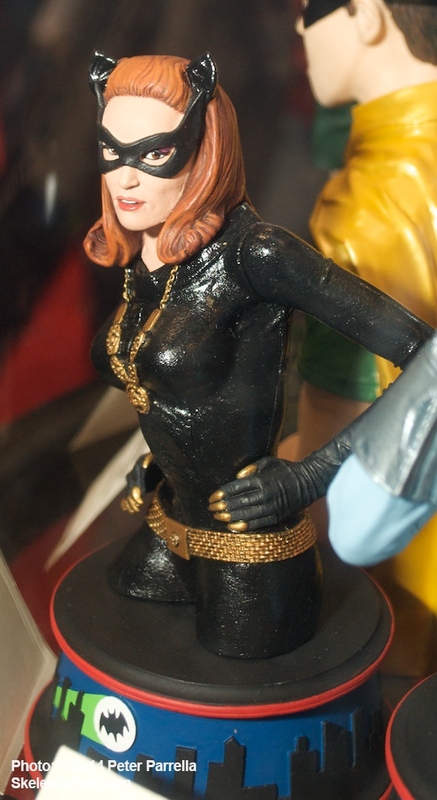 Diamond Select’s upcoming product sheet reveals a Julie Newmar as Catwoman, also sculpted by Moore, will join the Premiere Statue Collection in Fall 2015. 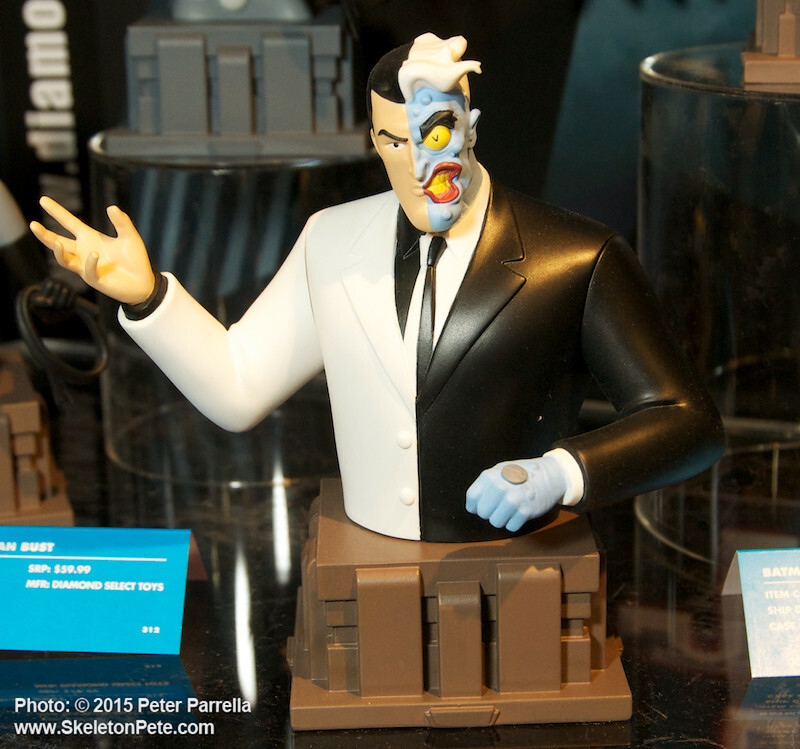 DST’s perfect Penguin mini-bust is due spring 2015. 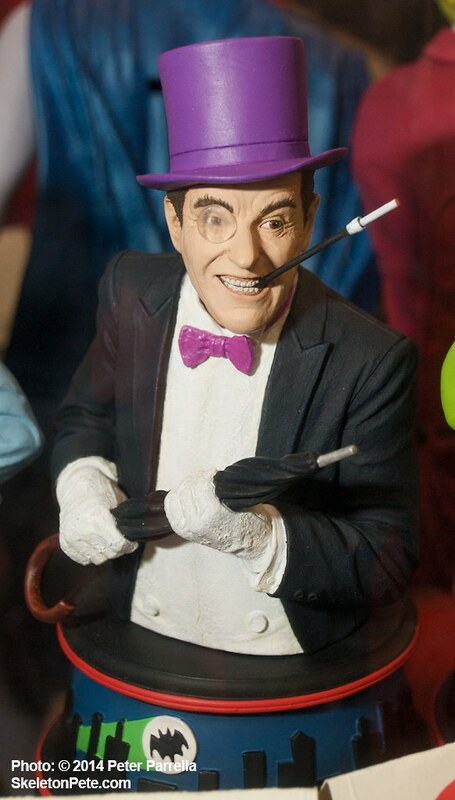 While I’ve enjoyed nearly everything about the Gotham television series’ first fall season, especially Robin Lord Taylor’s scenery chewing portrayal of the young Penguin, there will always be a special spot in my heart for Burgess Meredith’s version. His emotive squawking got many an imitative 6th grader, myself included, in hot water at school but it was irresistible to mimic. In 1966 my family was the first on our block to have a color TV which automatically designated our living room ground zero for every friend on Wednesday & Thursday evenings at 7:30. Along with the pop art biffs, bangs and pows, Penguin’s psychedelic purple top hat and tie were the most eye popping things to behold on that fresh CRT. 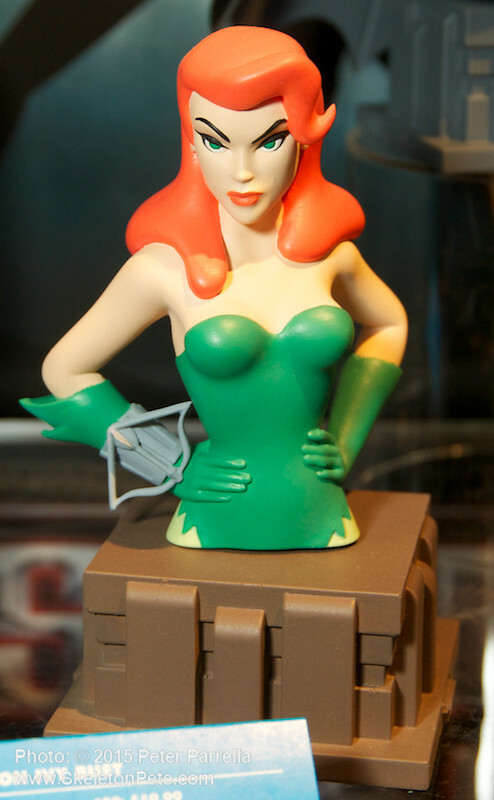 A Rogues Gallery of Diamond Select Mini-Bust Prototypes. 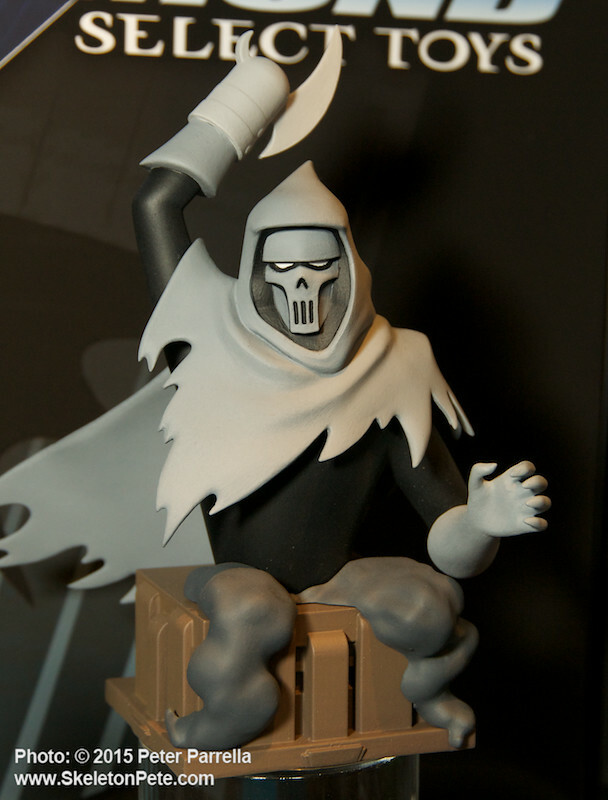 Licensor Approval Pending. Keeping “Boomer” generation collectors enthralled (we waited ages for this franchise to license goodies)Diamond Select Toys has announced a late spring 2015 release for their latest Batman related mini-bust. 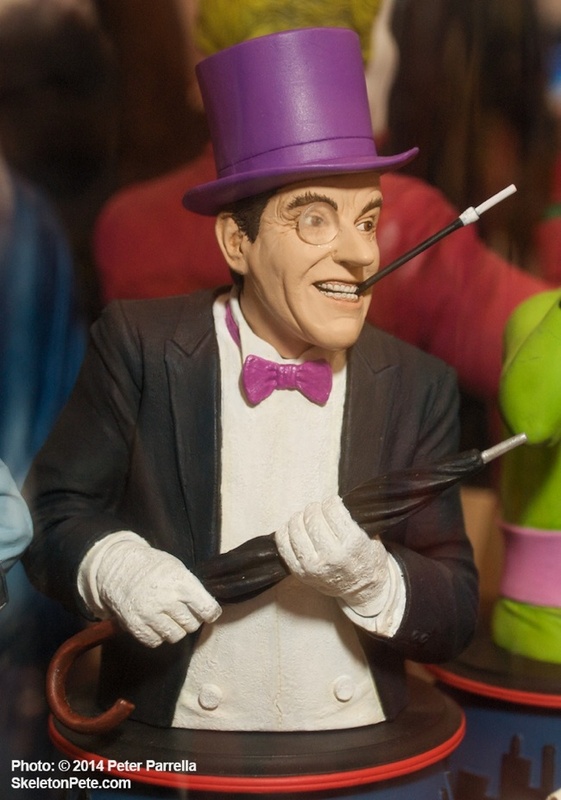 It’s a spot on sculpt of the Burgess Meredith Penguin right down to the monocle. 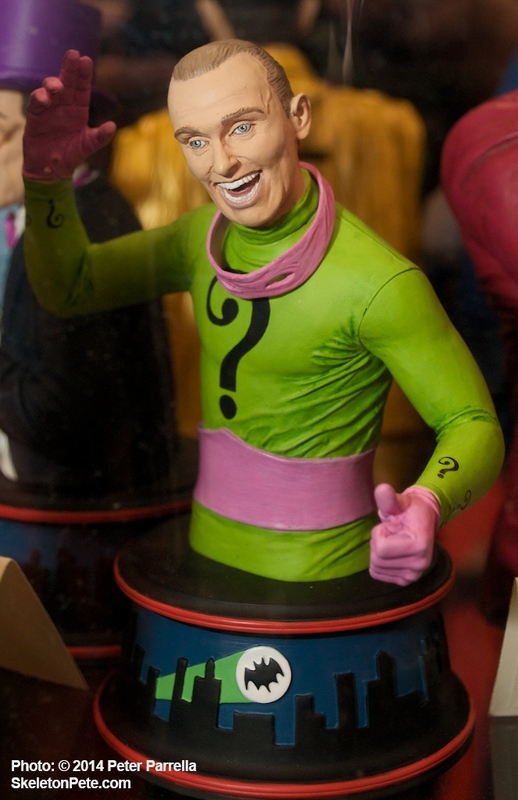 It will join the already released Adam West Batman, Burt Ward Robin, Ceasar Romero Joker, and soon to be available Frank Gorshin Riddler (January 2015). 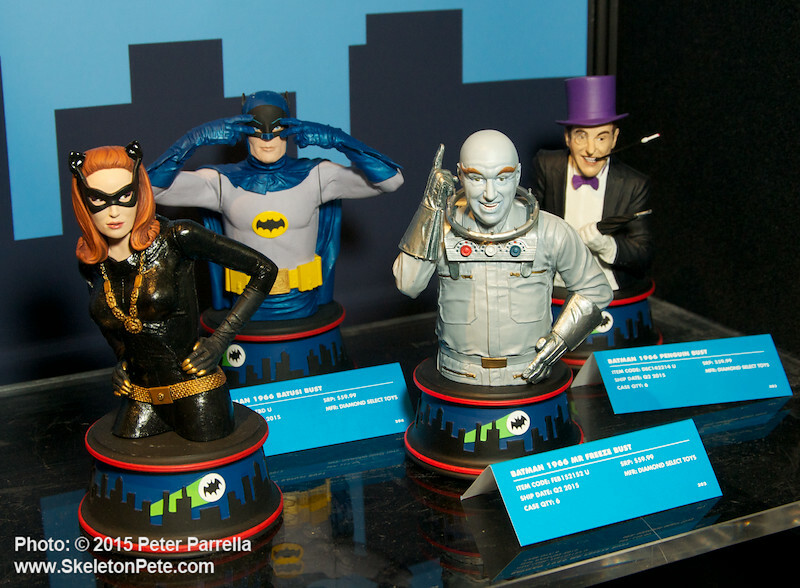 At NY Comic Con back October, DST was also showing yet to be authorized prototypes of Julie Newmar as Catwoman and Otto Preminger, the blue skinned Mr. Freeze. Yvonne Craig in Batgirl guise would clearly be a welcome addition to the mix. 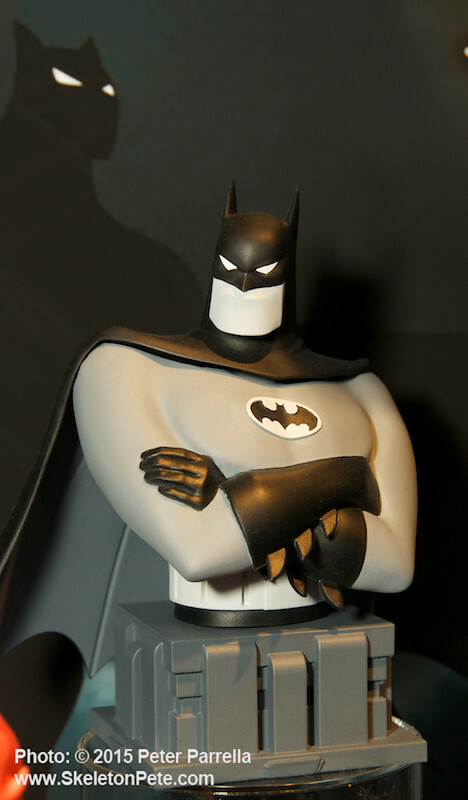 The mini-busts average six inches tall and share a base that features bat-signal/city-scape artwork from the classic show’s opening credits. 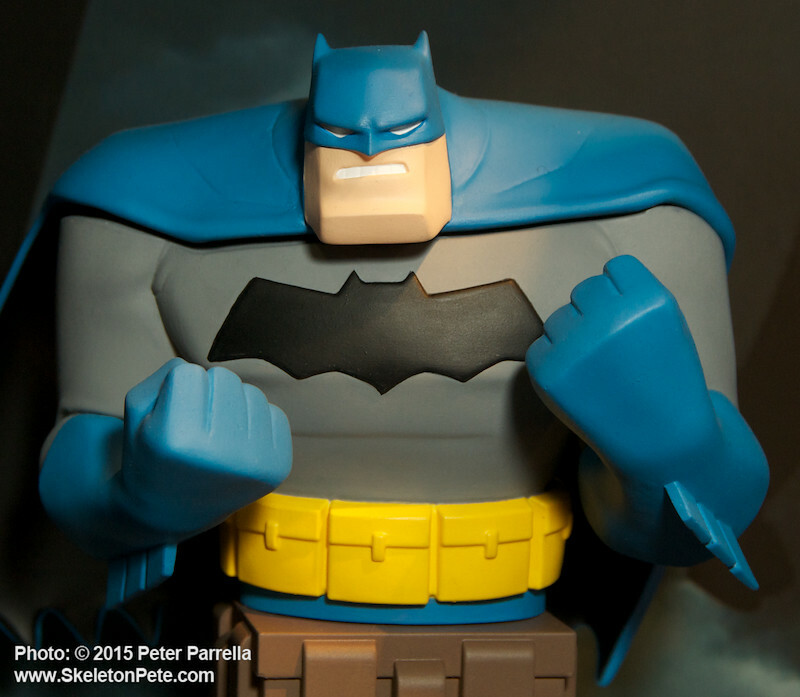 Diamond Select’s Batarang and Batman Logo serve double duty. If you are expecting Santa to slide down your chimney with the 1966 Batman DVD box set, you could do worse than add DST’s Batarang bottle opener to your stocking stuffer wish-list. It’s gonna take a raft of six-packs to get you through 120 episodes.